The seven #NatureForAll strategies offer solutions to a worldwide problem of disconnection from nature. They have been developed based on recommendations received from the 2014 IUCN World Parks Congress and the 2016 IUCN World Conservation Congress, and advice from #NatureForAll partners worldwide. They will continue to evolve over time. Not every strategy may be applicable in every situation, so our partners choose the one(s) that work best in their local context. The Belgian Biodiversity Platform is a science-policy interface organising many events and actions around biodiversity and related themes.. In May 2018, we organised a field trip with scientists and decision-makers in a Belgian forest. During this day, we discussed many topics related to biodiversity, its intrinsic value, its benefits to people, and what we can do to protect it and enhance a better future. As a science-policy interface, this type of actions allow for different communities to learn from each other, exchange ideas and knowledge. We believe this is key for a sustainable future in which people can experience and benefit from a healthy environment. We have other examples of activities enhancing networking among diverse types of communities. One milestone in this respect was the organisation of ‘Positive Vision for Biodiversity’, a 2-day summit which gathered 250 people from many walks of life, from scientist to artist, from decision-maker to philosopher, from businesses to administrations… This summit resulted in a framework with a Positive Vision for Biodiversity and we are still using the results of this event few years after it has passed. Later this year, we will organise a similar event with a scale comparable to this event. We also plan to organise a conference for scientists, designers and architects (in order to discuss how to protect biodiversity in fields such as design and architecture); and a network event on Biodiversity & Health interlinkages. By organising such events, we hope to enhance the interaction between communities that tend to not often work together. 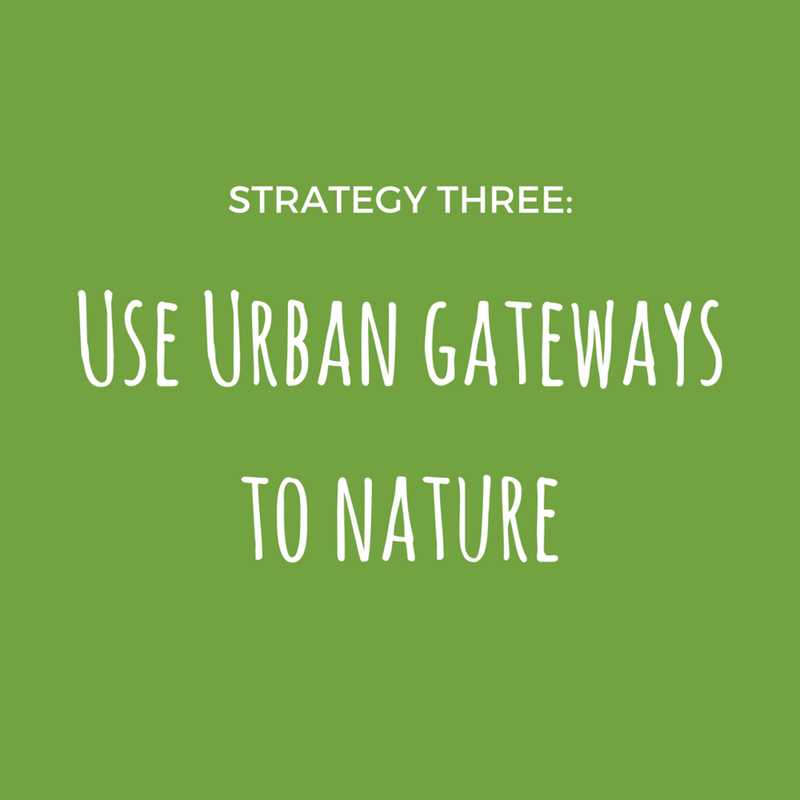 Using urban gateways to nature for bringing urbanities closer to nature is a new strategy for us. On 9 May 2018, we organised a field trip in a forest in Belgium (see photo), during which scientists, decision-makers and practitioners gathered for a walk which was studded with several short pitches by practice professionals. Topics of discussion varied from urban forests, recreation pressure, cultural heritage, to biodiversity conservation, wood production, climate… We believe that this type of initiatives is very important to ensure that people working in administrations or research institutes do get to really reconnect with nature, and maybe increase their interest in and connection to the very topic they work on, on a daily basis; far from their desk and computer. We make use of technology mainly by mobilising biodiversity data, publishing it online to render it accessible, and provide technical support and tools to scientists wishing to share their data with a wider audience. Even if the mobilisation of data is not an action which directly engages moments of connection between people and nature, it is however, a very important step in order to ensure that the knowledge of the current living world is well recorded and stored. This is a moment in time in which nature reaches many tipping points. It is therefore crucial to document its current status, provide baseline data, and render it accessible online, for decision-makers to make evidence-based decisions, for other scientists to build upon the work of others, and for any citizen to access scientifically verified information about the diversity of species living on Earth today. Seeking out diverse partnerships is at the very core of the Belgian Biodiversity Platform. Our goal is to connect researchers to policy-makers and decision-makers, but also to people from other sectors which they may not often interact with. For instance, in 2010, we organised ‘Positive Vision for Biodiversity’, a 2-day summit which gathered 250 people from many walks of life, from scientist to artist, from decision-maker to philosopher, from businesses to administrations… This summit resulted in a framework with a Positive Vision for Biodiversity and we are still using the results of this event few years after it has passed. Later this year, we will co-organise a similar event with a scale comparable to that event which will be entitled ‘Think 2030’, in order to discuss, with participants with different backgrounds, what type of policy actions should be tabled and implemented post-2020. Also, later this year, we will organise a conference for scientists, designers and architects in order to discuss how to protect biodiversity in fields such as design and architecture. By organising such events, we hope to enhance the interaction between communities that often work in isolation. Our involvement in different European projects also lead us to organise various events in which a diversity of communities meet and discuss emerging issues. For instance, last year, we co-organised a workshop on Horizon Scanning, therefore connecting researchers to participants coming from a variety of backgrounds in order to discuss different types of trends analysis, weak signals, etc. This was a way for researchers to learn about other tools and techniques used in businesses and other sectors. Other emerging issues are often explored by us: for instance, biodiversity and health, biodiversity and society, nature-based solutions, etc. Overall, the Belgian Biodiversity Platform tends to make use of participatory approaches to allow of dynamic and inspiring exchanges. (see photo of participatory approach in one of our conference). In terms of empowerment of a new generation of leaders, we are not directly active per se, since we are not working with youth. However, we do contribute to a new generation of early-career scientists working on biodiversity in Belgium. This is particularly the case through the BElgian Ecosystems and Society community of practice (BEES) which was initiated and is still coordinated by the Belgian Biodiversity Platform. BEES is a growing and active informal network of Belgian ecosystem services experts, a community which is partly made of early-career scientists. For this audience more particularly, we organise the BEES Young Scientist Day on a yearly basis. This Young Scientist Day is an interactive event aiming at developing interdisciplinary cooperation and exploring transdisciplinary opportunities among Belgian young scientists (PhD students, young postdocs...) active in novel projects in the broad theme of ecosystems & society. Participants get the chance to create new collaborations, identify joint research topics and create linkages with policy and practice across disciplines and regional contexts. Furthermore, in terms of mentoring, we are very active in the Global Biodiversity Information Facility (GBIF), organisation for which we mainly work on the mobilisation and publication of biodiversity data, but also in which we actively participate in the GBIF mentoring programme. Basically, our ‘open data’ experts go in GBIF partners countries (mainly in Africa, and sometimes in Asia), to provide mentoring trainings, helping local teams to develop GBIF nodes in their countries, by providing technical support through trainings. In terms of biodiversity data publication, in 2017, there were 19 data publishers from Belgium that published data on GBIF, and we reached a total of over 20 millions published occurrences, 114 published datasets, and 232 countries, territories and islands covered by data from Belgium. Institutions from Belgium published 8,773,095 new occurrence records in 2017 for a total of 20,798,878 occurrence records. Once published, the data can be accessed and used by any interested party. In 2017, there were 18 peer-reviewed articles using GBIF-mediated data by co-authors based in Belgium. And overall, there were 6,029,475,314 records downloaded in Belgium by 121 users. We are also very active in the BiodivERsA partnership, a network of national and regional funding organisations promoting pan-European research on biodiversity, ecosystem services and nature-based solutions. So far, the network launched seven calls for a total amount of over 180 million euros; an investment that eventually impacts society and policy through knowledge generation and brokerage. Creating solid networks is very important for our organisation; be it with international or European partners, with Belgian researchers and administrations, or with Belgian media… We are constantly interacting with many types of people and organisations. In this respect, we organise many one-on-one meetings with key people, and we also keep on organising events for wider audiences to keep our community interested and active. Social media are also very important. We are currently mainly active on our Twitter account (though we use several others for some of our activities). We find that the community we grew on Twitter over the years has been very important. Sharing our news in social media has led to new collaborations and helped us reach way beyond our initial community. We also recently revamped our website to ensure clarity of information about our services, which is another key point to communicate with external audiences. In 2015, we conducted a user survey to assess how our activities were perceived in our community, and whether other types of services would help them in their work. We found the results very interesting to re-assess the type of activities we conduct, and we are therefore going to conduct another survey of this type in 2018. We also think that sharing our knowledge of past activities is important. We therefore have a ‘tips and tools’ page on our website on which we share lessons learned and best practices with our community.